Tom Geary with his wife Anne Geary inside their business. Taken Jan. 22. DARIEN — When it comes to framing items, Geary Gallery owner Tom Geary has seen it all — from clothing to shotguns and canoe paddles. “We do a lot of things like this. A lot of mementos,” Geary said, recalling a Ridgefield customer who asked him to frame her children’s first hats and sneakers. His team was able to mount the objects in museum boxes. 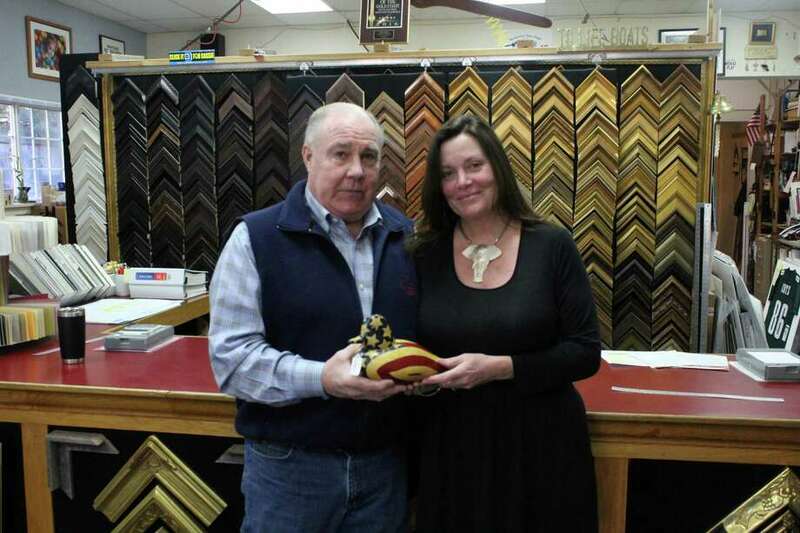 The 67-year-old Norwalk resident has owned his framing and restoration business in Darien for over 30 years. His first foray into framing came while working with his wife’s brothers in craft stores in Florida. “I had previously built houses and built a restaurant, so I had some mechanical knowledge,” Geary said. With no formal training in framing, Geary said he picked up the craft through repitition and constant work. visit https://www.gearygallery.com/ to learn more about Tom Geary’s business. “I learned as I went,” he said. After four years in Florida, Geary moved back to Connecticut and decided to open his own store in Darien. His current store started off as only 1,000 square feet, before eventually expanding to include the Geary Gallery, which now features a collection of artwork from various artists. His decision to start the Geary Gallery came after taking over a similar business of a friend. When his friend moved to Maine, Geary decided to officially merge the business into his framing shop. While likes and dislikes in art have changed over the years, his core base of customers has stayed consistent. This mix includes everything from realistic and impressionist paintings, to even abstract paintings. “You never know what someone is going to like when they walk through the door,” he said. Although Geary and his wife grew up in Stamford, their famliarity with Darien comes from years of running other businesses in town. Geary was involved in the opening of Rory’s Restaurant, and being involved with the community influenced his decision to open his framing shop. As a local business owner, Geary said mom-and-pop stores are vital to a community. Geary said he doesn’t look at his workers as just employees, and instead works to create a family environment. He extends this same ideology to his customers.